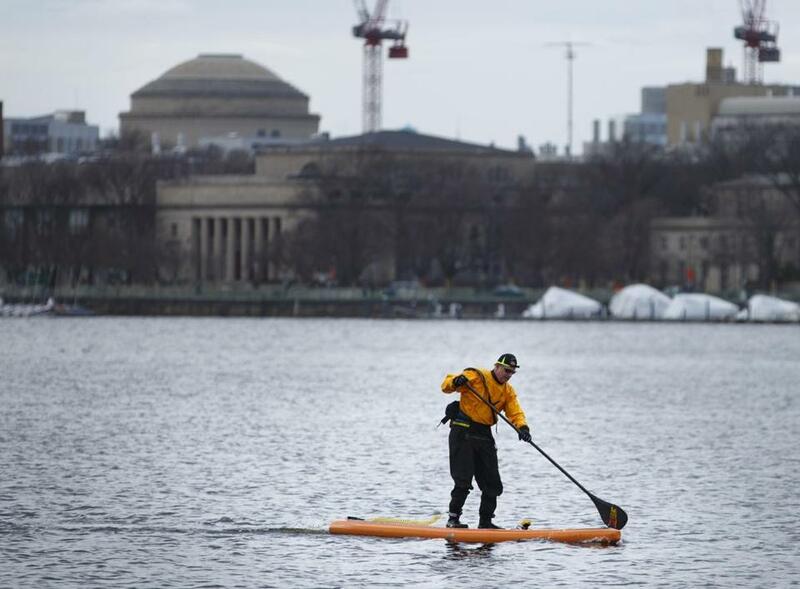 A paddleboarder braved the chill to row along the Charles River last week. After decades of ceding control to the federal government, state environmental officials are moving quickly to assert authority over the amount of pollution allowed in the state’s waterways, a decision environmental advocates fear could weaken protections and harm water quality. The controversial plan would require the state to spend millions of dollars to monitor water quality and enforce compliance, tasks now performed by the US Environmental Protection Agency. Massachusetts is one of just four states that do not directly oversee how much pollution enters its rivers, estuaries, and other water bodies. The EPA has been responsible for the often controversial work, at its own expense, since Congress passed the landmark Clean Water Act in 1972. Now, despite major budget cuts at environmental agencies in recent years, Baker administration officials say state control would potentially reduce costs for cities and towns, reduce bureaucracy, and make the permitting process more efficient, with regulators more attuned to the specific needs of municipalities. But environmental advocates say there are good reasons why Massachusetts hasn’t made this move before. They worry that state officials could dilute regulations as a result of political pressure or cozy relationships with local leaders and companies such as treatment plants. By contrast, the EPA has been insulated from such pressure and has done an effective job overseeing the cleanup of rivers, from the Housatonic in the Berkshires to the Charles in Boston, they say. “We worry that polluters are trying to get ahold of the regulatory agencies,” said Julia Blatt, executive director of the Massachusetts Rivers Alliance, an advocacy group in Boston. When the Patrick administration considered such a move, environmental officials ultimately decided against it. Environmental advocates also worry about the state’s ability to cover the costs of the new responsibilities, when the department is already struggling to cope with its current workload. The department has about 650 employees, down from 1,000 employees in 2000, as a result of budget cuts. Just in the past year, the department shed nearly 100 employees. Environmental groups shared that concern. But proponents of the change say advocates’ concerns are exaggerated and argue that the department could well go beyond current environmental protections. “We think there would be a lot of benefits, given that there’s already a field operation on the part of DEP, and DEP understands communities in a much clearer way than EPA,” said Geoff Beckwith, executive director of the Massachusetts Municipal Association, which lobbies on behalf of cities and towns. For example, Beckwith expressed “grave concerns” about a forthcoming EPA permit that would require some municipalities to spend millions of dollars to reduce stormwater runoff. Beckwith and others say the DEP would be easier to work with and provide more flexibility for already cash-strapped municipalities. It would be simpler for them to deal with one regulator on water issues, rather than two, they add. EPA officials say they support the state’s efforts to assume control over water pollution. The only other states that have not taken this step are New Hampshire, New Mexico, and Idaho, which is seeking a similar approval from the EPA. The approval process could take several years, and the state has to prove it can comply with the requirements of the federal Clean Water Act. To do that, Massachusetts officials said they plan to seek legislation that would allow the state to obtain fees from treatment plants and other polluters to help pay for monitoring and enforcement. Either way, EPA officials say they will maintain ultimate oversight. If the state fails to comply, the federal government would step in. “We do systematic reviews of the state’s programs to make sure they’re applying the federal statues in accordance with federal law,” said David Webster, manager of the water permits branch at the EPA in New England.